We occasionally like to bring our readers details of video comparisons of popular smartphones and tablets, and today it’s the turn of the iPhone 5 with iOS 7 vs. Samsung Galaxy S3 Mini. This may sound a little odd as the Galaxy S4 is out with the Galaxy S4 Mini arriving shortly. Nevertheless, we thought this video offered an interesting look at the two devices. Of course the iPhone 5 doesn’t yet run iOS 7, as the upcoming Apple mobile operating system is only available in beta form to developers right now. However, the iPhone 5 shown in the video is running iOS 7. We’ve posted a lot of news about iOS 7 since it’s introduction at WWDC last week, and the update is scheduled for a public release sometime in fall. We came across the 12-minute YouTube video that gives a good overview of both smartphones. The Galaxy S3 Mini that is used is running Android 4.1.2 Jelly Bean, and the video begins by discussing the higher price of the iPhone. The reviewer goes on to point out the better design and app experience of the iPhone before showing the lockscreens, and then shows the camera app on the iPhone 5 with iOS 7. It continues with a look at the new control center of iOS 7 on the iPhone 5 and compares this with the Galaxy S3 Mini, and then notes that as the latter runs Android, users are able to customize the device. There’s a look at Search facilities, home screens, multitasking, swipe gestures, voice assistants and more. In conclusion the iPhone 5 is noted to have a better design and cleaner views, and reference is made to the fact that Apple is good at finding features that people will use most. To balance this out though, the reviewer notes that the Samsung Galaxy S3 Mini has a removable battery, freedom of customization and expandable memory, plus it has a much lower price. Why not check out this video review that we’ve embedded for you below this story. 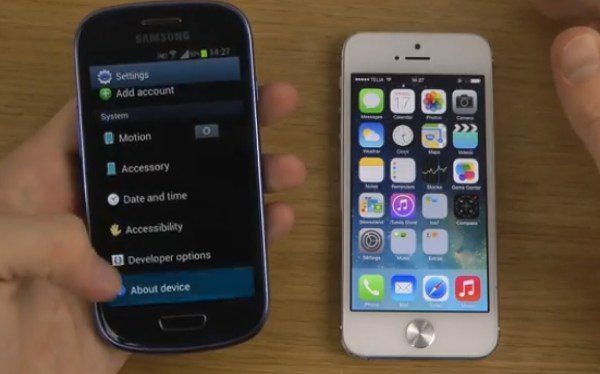 We’d like to find out whether you favor the iPhone 5 with iOS 7 or the Samsung Galaxy S3 Mini? What points do you think make the iPhone 5 better than the S3 Mini or vice versa? Let us know with your comments. You should have searched for a way to put 4.3 in the S3 mini like you did for Ios 7 on the iPhone 5. Also should have mentioned how old 7 borrowed a lot from Android and even BlackBerry. What did it borrow from android and BB????? # Pirth IV – are you so naive or you are just another apple biased person who refuse to see what iOS7 has borrowed or say stolen from android..
No…I really want to know what did ios 7 borrow or steal???? The sliding, the interface, the icons, should i continue? Slide to unlock??? ?Ios UI ?? ?flat icon????? ?….continue…what other lies can u say????? As u guys don’t know anything…..androids are featureless phones compared to ios…….say any droid thing that’s not in ios….plZ dont say that …..android lags ,can ur ios ????? General feel of iOS7 is very Android-like, according to multiple sources. As to BB borrows, I haven’t heard that. Ios 7 is really cool ….used beta….it is clearly different than android….